British classical label, mainly issuing stereo recordings from the Supraphon archive. The first set of releases had covers with a white background and were released in 1975. In 1977, Rediffusion Records reissued most of the titles with coloured sleeves, keeping the same catalogue numbers, and added additional titles. 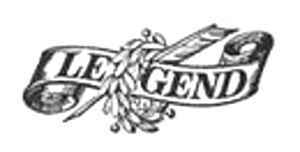 Whilst there is no reference to Rediffusion on the 1975 releases, it is assumed that Rediffusion Records either owned Legend from the start, or purchased it shortly after launch. Both Rediffusion and the 'white' Legend releases were usually designed by Stephen Hill Design Services. LGD002 Suk Trio Beethoven: Piano Trio No. 6 In Bb, Op. 97 "Archduke"
LGD 004 Antonín Dvořák Symphony No. 9 In E Minor "From The New World"